Kaarel Liimand, who only lived to the age of 35, is one of the most poetic artists in the older history of Estonian art. Liimand did not paint very much during his creative career that lasted only eight years and most of his works are in Estonian museums. 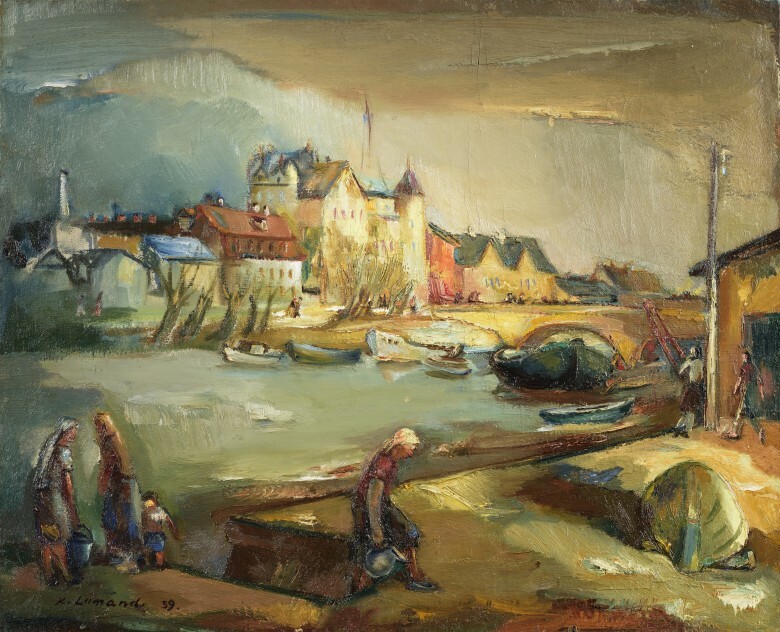 His body of creative work encompassed both paintings and prints, including compositions, portraits and nudes, but also cityscapes of Tartu and landscapes. Colour is always first and foremost, and Liimand used it in thick layers and as surfaces. Tartu is Estonia’s second largest city and in the 1930’s, it was the centre of Estonia’s art life. The higher art school was located here and many artists lived in the city. Thus Tartu has also been depicted a great deal in older paintings. Tartu suffered a great deal of damage from bombardment and fires during the Second World War and the houses that Liimand depicts here in this painting have been destroyed by today. For this reason, this is a portrait of a lost city. Since Kaarel Liimand died young, very few of his works have survived. Large-scale urban views are thus all the more rare. Left-wing socialist moods repeat in Liimand’s creative work: together with Andrus Johan, he liked to depict everyday life and the living conditions of the people living there. Interestingly, he has added the motif of working people here as well, situating women carrying water in front of the splendid view of the city. The greatest value of this painting, however, is undoubtedly Liimand’s exceptional usage of light and colour, where the colour range is simultaneously both sensitive and powerful.